Rosa's Bus covers a worthy topic from an unusual point of view. The book tells the story of Rosa Park's 1955 protest that sparked a bus boycott and desegregation, beginning, and ending, with bus #2857 itself. Dark, muddy oil illustrations lend a sense of gravitas. Probably the least successful among them is the illustration of Rosa being asked to give up her seat. The bus was supposedly crowded and the text even mentions this, but in the painting most of the other seats appear empty. While the bus as a character is not the most riveting Rosa Parks story out there, it still gets to the heart of an important historic moment. The bus was later sold at auction in 2001 by Donnie Williams, who inherited it from his father-in-law Hubert Summerfield. Summerfield had come into possession of the bus when it was going to be junked for spare parts, and sensing the crucial place in history this particular bus had, purchased it, and stored it out of the way for many years. Storywise, I think it would have been more stirring if Williams had donated the bus instead of selling it, but the book sticks closely to historical fact. The bus has now been fully restored and is on display at the Henry Ford museum. 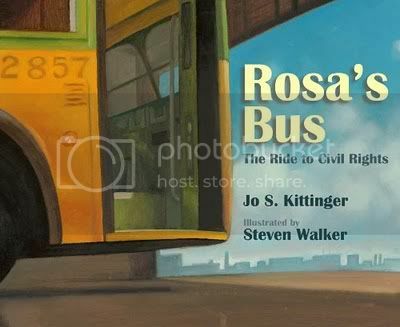 An interesting addition to most civil rights collections, this book offers a unique perspective and plenty of educational backmatter including info about the bus and an author's note explaining that Rosa Parks was not actually the first person to protest segregation. The book is further appended with an extensive bibliography including websites. Recommended for ages 8-12.